Circle Craft Christmas Market returned to Vancouver this year from November 7 to 11. The annual event, which has been taking place for decades, featured over 300 Canadian artisans and vendors—82 of which were new to the market entirely. Thousands of people packed the Vancouver Convention Centre West over the five-day event, eager to begin Christmas shopping and discover new goods. The exhibition hall bustled with volunteers, attendees, and participants roaming the hundreds of unique booths set up across the room. Circle Craft offered an impressive variety of goods including Christmas decorations, pottery, clothing, home décor, jewellery, wood and metal work, visual art, and food. The lineup of vendors ensured that everyone’s shopping lists and desires could be met. A portion of the room featured a “Budding Artists” area which allowed first-time exhibitors to get the experience of a large-scale market and offer their products to attendees without having to commit to a full booth and display. The Budding Artists area featured such crafters as Bitter Melon Bindery, a custom sketchbook, watercolour book, and journal vendor who offered customers the chance to emboss the handbound journals for a small fee. Fitzy, a modern leather goods vendor, offered quality tote bags, purses, wallets, passport holders, and more. Bare Skin Bar had a display of “self-care treats” featuring bath bars created with essential oils, butters, and clays to help restore, calm, and detoxify or soften the skin. Demonstrations peppered the hall, catching the attention of passersby. Dragonfly Organic Art showed off live glass beading, Lennard Taylor Design Studio painted dresses, and an active pottery wheel sat in the middle of the hall for potters to take a spin on. 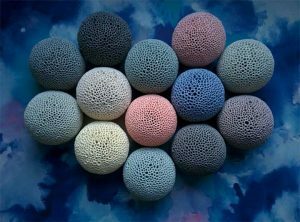 Karolina-Anna Hajna offered handcrafted pottery pieces constructed to look like dried coral, serving as lanterns when a tealight is placed inside. Ana N Jay displayed colourful jewellery, which is handmade with resin, gold leaf, and recycled tin, then cut into funky geometrical shapes. East Van Light had a bright display of vintage-inspired industrial lamps built with locally-sourced wood and Edison bulbs. Some of the lamps for sale were made out of recycled bamboo chopsticks collected from local restaurants. They boasted a sleek design as well as a commitment to sustainability. Edible treats included handcrafted orange bitter spritz, tonic, cola, and ginger ale flavoured cocktail syrups by Three Quarter Ounce; fruity, low-sugar jellies and savoury vegetable jams by East Van Jam; and fresh, artisan goat cheeses from Salt Spring Island Cheese. For those who are disappointed to have missed out, Circle Craft has a storefront on Granville Island that features many of the artists and vendors who were present at the market. If the market experience is what you’re after, have no fear! With Circle Craft’s 47th annual market wrapped up, all you have to do is wait for its welcome and much-anticipated return next year.